Congratulations! 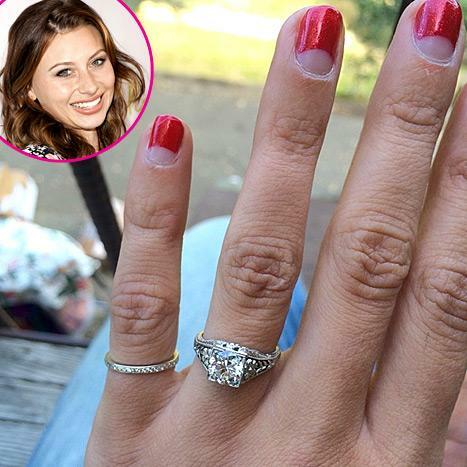 Two and a Half Men star Aly Michalka is engaged to her boyfriend of just over a year and a half, Stephen Ringer. The 25-year-old actress announced her happy news via Instagram in the early hours of Wednesday, July 16, with a snap of her stunning ring and the caption, "So this happened.....7/8." The pretty actress initially posted a picture of herself casually wearing her new piece of bling while posing with her younger sister AJ at a recent event. She teased fans, writing, "Hmmm....no one's noticed yet. #Lookcloser,” but was evidently unable to control her excitement, and quickly updated her account with a second picture, this time a close-up of the sparkler. Taking to Twitter to spread the news further, excited Michalka wrote, "Wanted to share the exciting news! Feel very blessed to know such a great love #engaged x Aly." Earlier this month, the actress shared a picture of herself and film director Ringer, marking the occasion of their one year and seven month anniversary. The pair smiled for the photograph while having a romantic dinner together. A few days later the happy couple snuggled up for another intimate snap, this time while staying in Big Sur, a few days after getting engaged.